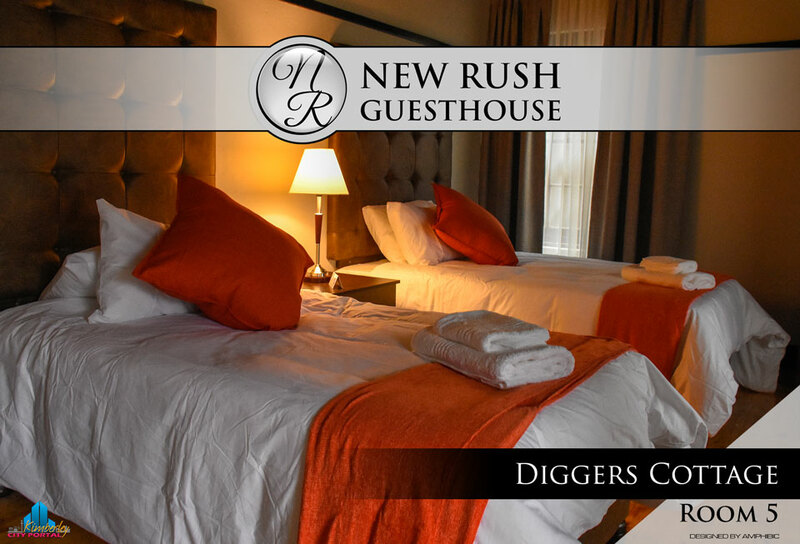 Experience luxurious lodging at New Rush Guesthouse in the Heart of the Old Town at the Big Hole Complex in Kimberley. Most businesses and attractions are within five minutes drive from the guest house. Accommodation in Kimberley will never be the same again! 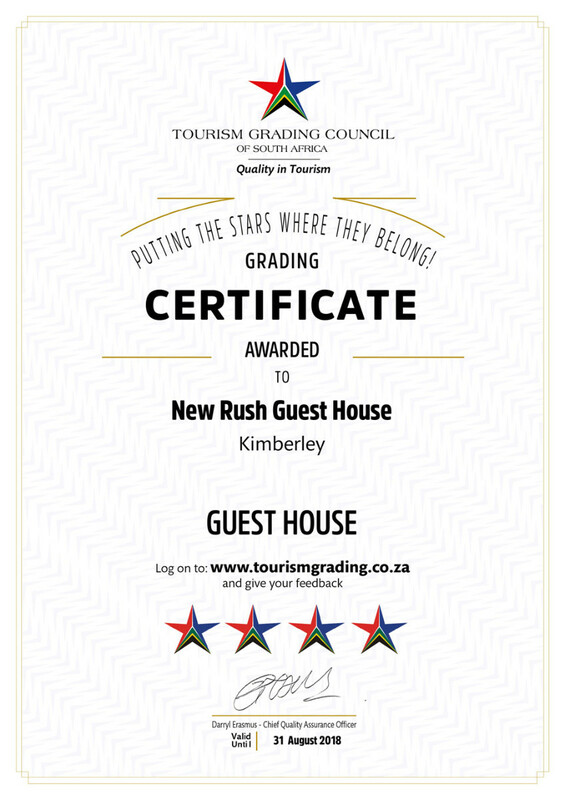 New Rush Guesthouse holds a 4 Star Grading with the Tourism Grading Council of South Africa. 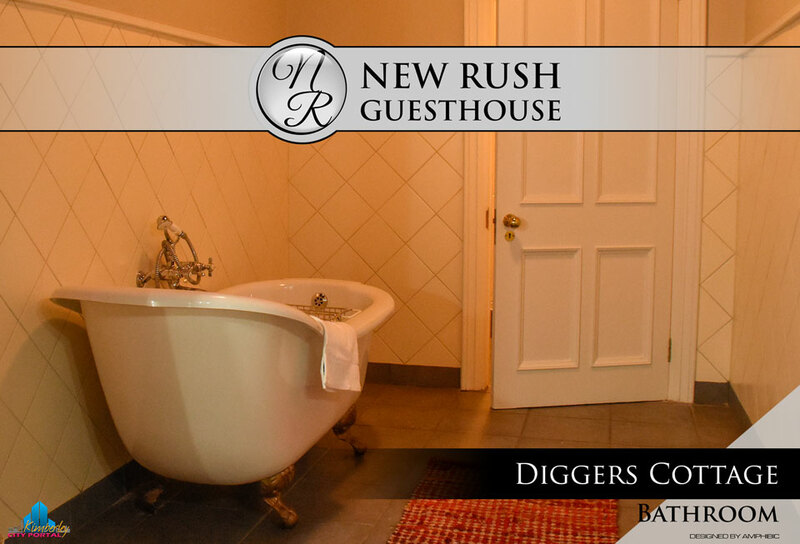 Stay over in the Old Town at the Big Hole and experience the Diamond City as it was 100 years ago! The newly refurbished units boast thirteen modern designed en-suite rooms accommodation up to 26 people sharing. Originally owned by Harry Woodward, the Hotel was sold to WH Craven, a well-known entrepreneur of early Kimberley and later the first Company Secretary of De Beers from 1888 to 1897. He was a partner of Charles Rudd and Cecil Rhodes in various ventures in the 1870s. 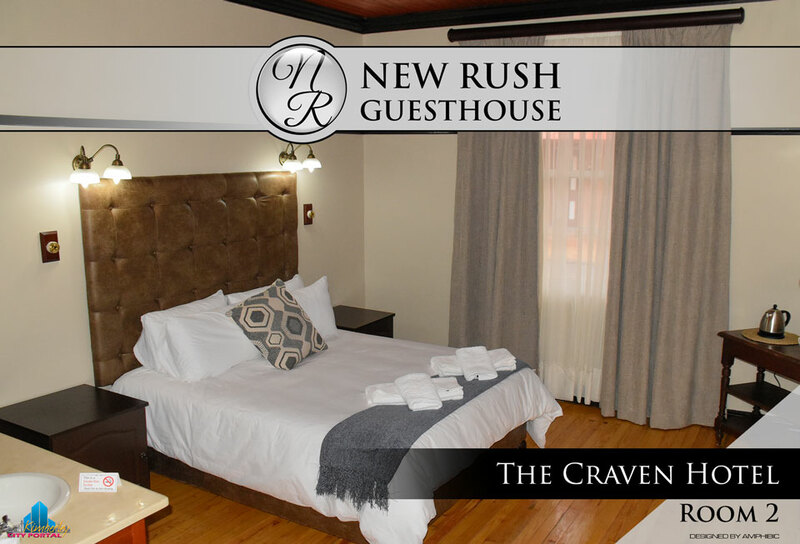 The Hotel was known affectionately as The Craven Club, and was famous for being the birthplace of the Kimberley Club in 1881, as well as for the location of the formation of the original SA Rugby Board in 1892. WH Craven died at Las Palmas, USA, on 15 January 1897. 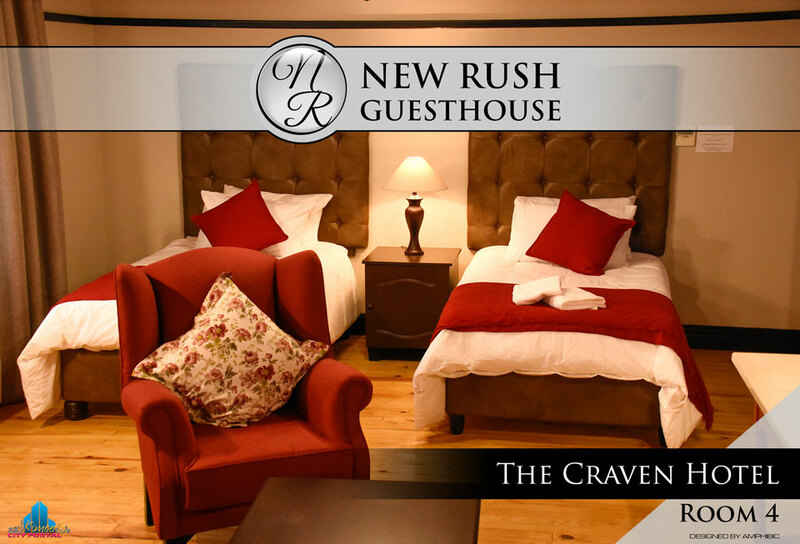 The Craven Hotel is a replica of the original constructed at the Big Hole in 2006. 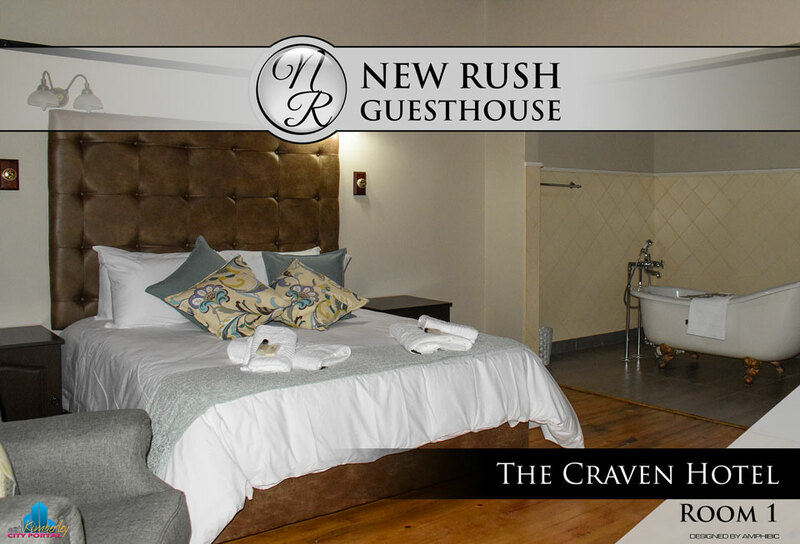 Room 5: R1500 - 1 x Kingsize bed and 2 x ¾ beds in separate room, 4 persons sharing. The rooms share a bathroom and there is a lounge area in the corner of the main bedroom. This original “tin” house was relocated from 19 Tucker Street to the current location. The house dates back to 1878 and was owned by the Holmes family who sold it to a Mr Binyon who in turn sold it in 1913 when the Yeowart family moved in. The Yeowart family, one of whom resided here until 1973, sold the building to the Museum in 1975. The original Mr Harold Holmes of Holmes' Garage was born in the house in 1904. The doctor in attendance at his birth was Dr EO Ashe and his surgery forms part of the displays in the Old Town. After the delivery Dr Ashe gave Holmes' father One Pound sterling to place into his newly born son's account at The Perm. (Mr Holmes' father used to service Dr Ashe's vehicle). In 1913 Mr Yeowart purchased the house. He was an engine driver on the main skip at the Kimberley Mine headgear. After serving in World War 1, he returned to work at the Kimberley Mine where he lost his leg in an underground rock fall. Mr Yeowart was then transferred to the Guard Department and retired in that position, dying in 1951. When his wife died on 7 March 1989, she was the De Beers' Company's oldest pensioner. 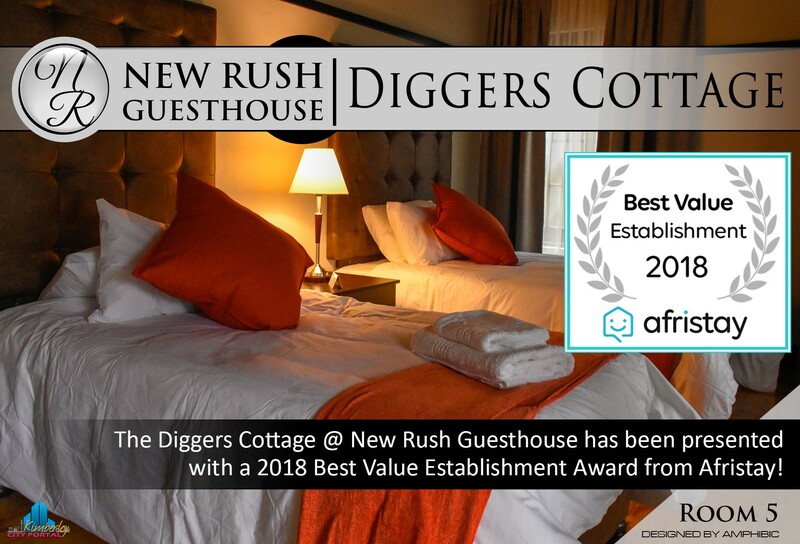 The Diggers Cottage @ New Rush Guesthouse has been presented with a 2018 Best Value Establishment Award from Afristay. 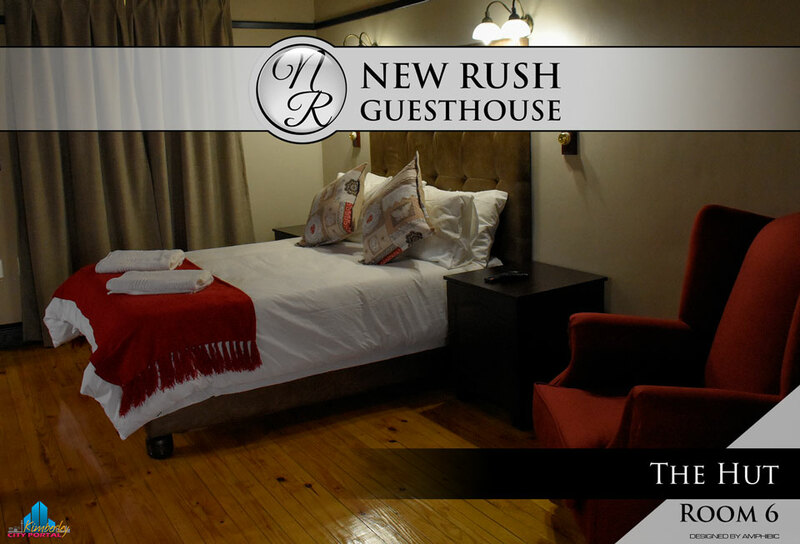 Room 7: R1250 • 1 x Double bed + 1 ¾ bed, 3 persons sharing. This room includes a separate lounge with TV. The Hut is one of the original buildings at the Big Hole. The house was built in the 1880s and used as a police station with a holding cell to the rear. Sergeant W Sadler stayed here in 1903 until he was replaced with Detective D Nelson 1907. The Borgstrom family owned the house from 1914 until the 1940s. This is an original building constructed in 1903. The first resident of this house was WS Hall and George Abbott resided here from 1910 until at least 1914. Gideon and Maria Grobbelaar lived here in the 1930’s. This original building was constructed around 1906 on the same property as Number 5 Tucker Street. The first resident was P Whibley. In the 1930s Irene Flatt was in residence. 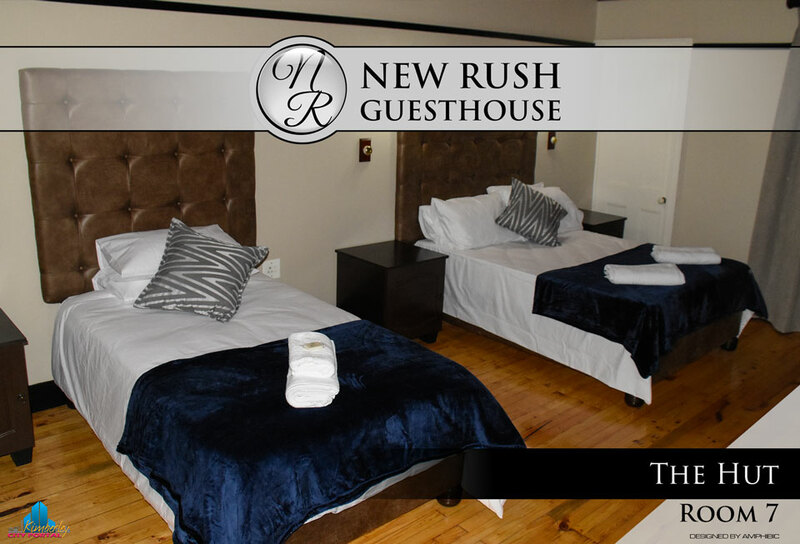 The New Rush Guesthouse has its own private, secure covered parking inside the complex with 24-hour security. Also available is our great function or conference facility. Established in 1873 on the edge of the Big Hole the Australian Arms Guest House was most conveniently situated as a boarding house / Hotel for miners, diamond dealers and hawkers including those that has just popped in for a drink or two. 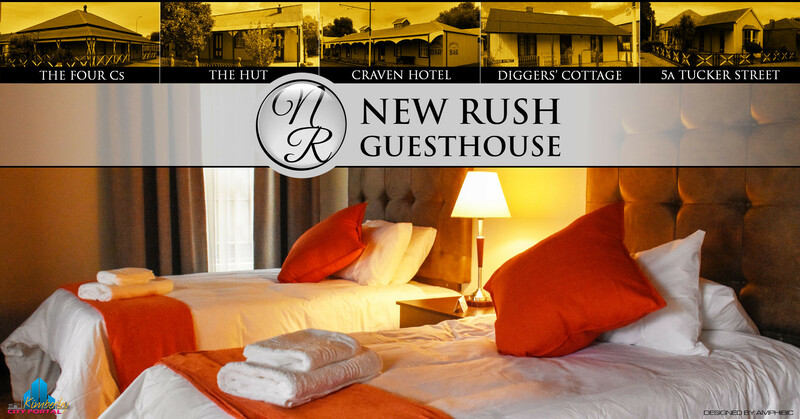 The location of The Australian Arms Guest House, now recently revamped and called The New Rush Guesthouse, is today still relevant and ideal for visitors to the Diamond City with most businesses and attractions within five minutes’ drive from the guest house. 0% Refund: Bookings cancelled 6 or more days prior to arrival. Any reduction in the length of stay will result in cancellation fees being applicable. Other amendments to your reservation are subject to availability. Thank you for a top standard experience. From the first phone call to our departure, we had a great experience. We loved staying in this historic old town with good restaurant close by in the old town. My only complaint would be the pillows that is so big and hard, we could not sleep on it (we used our jackets!!). Started our road trip 1 October and this has been the best place! Definitely staying over on our way back home.